It seems counterintutive, but a sharp knife is actually safer in the kitchen and around the grill than a dull knife. When a knife is dull, we saw, hack or force it through whatever it is we’re trying to cut, and it’s in those moments that we lose control of the knife and cut ourselves. A sharp knife is easily controlled because it slices through meat or veg or bread smoothly and easily, and is therefore safer. The folks at America’s Test Kitchen suggest that you test your knives for sharpness as follows: Grasp the top edge of a piece of printer paper firmly with one hand and draw the knife blade across the edge of the paper from heel to tip. The knife should slice easily through the paper with minimal effort. There are many ways to sharpen knives. 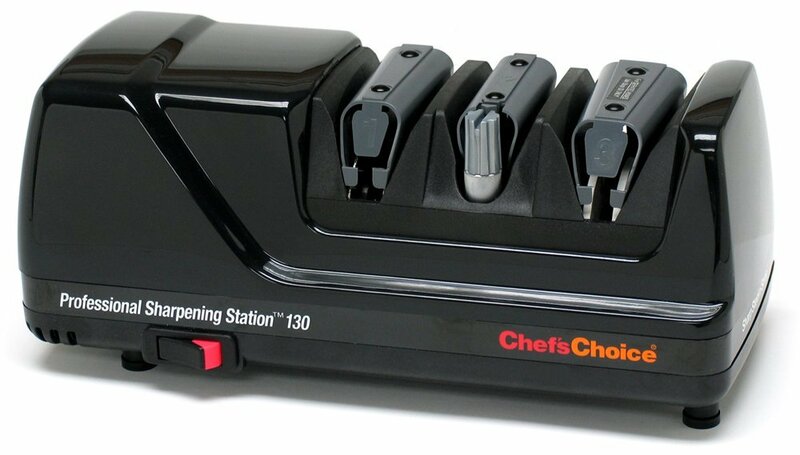 One of the best electric sharpeners is the Chef’s Choice 130 Professional Knife-Sharpening Station ($150). I’ve used this sharpener for many years and it does a fine job. Less expensive options include the Chef’s Choice 464 Pronto Manual 2-Stage Diamond Hone Knife Sharpener ($39) and the AccuSharp 001 Knife Sharpener ($9). 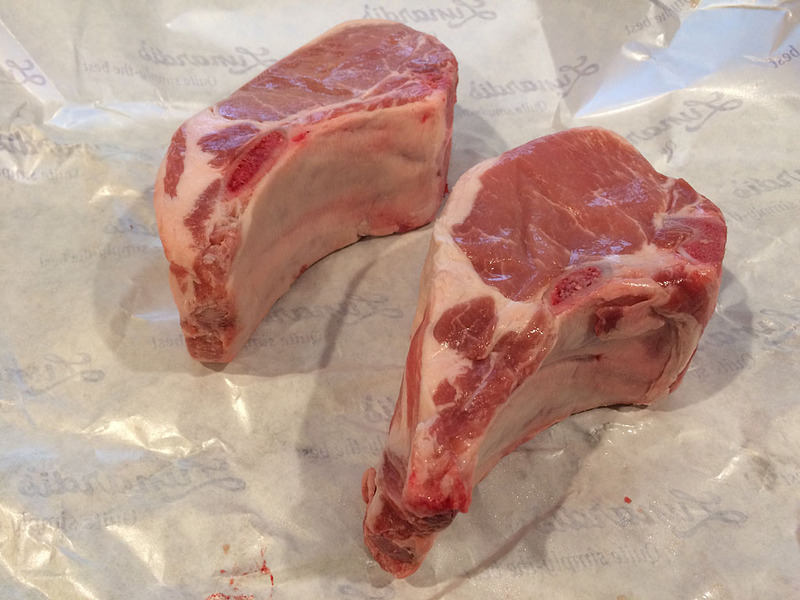 I spotted some beautiful, double-thick, bone-in Niman Ranch pork chops at a supermarket here in San Jose. I thought they’d be a real treat for my birthday dinner. What could be better than giving myself the gift of delicious, juicy pork? 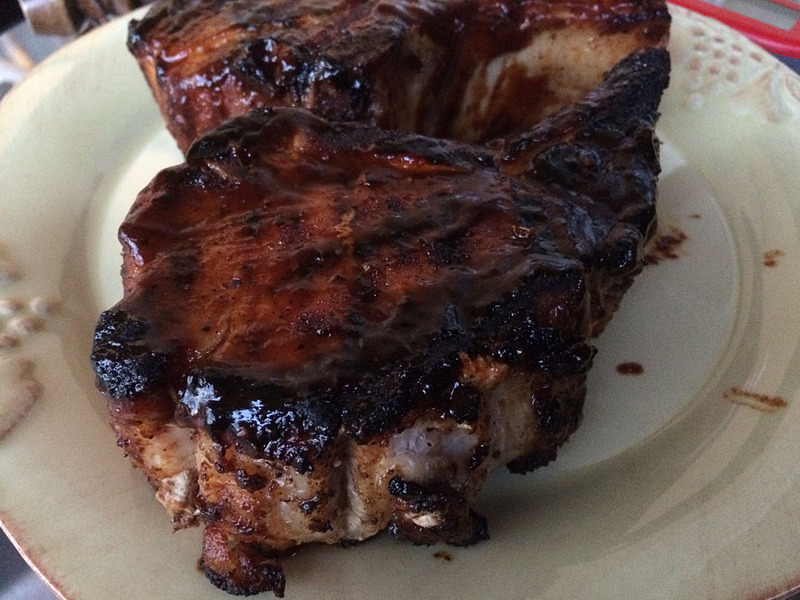 Here’s how I grilled these chops on the Weber Summit 450 gas grill. To prevent the chops from cupping during grilling, make a series of cuts around the edge of each chop through the fat just to the meat. 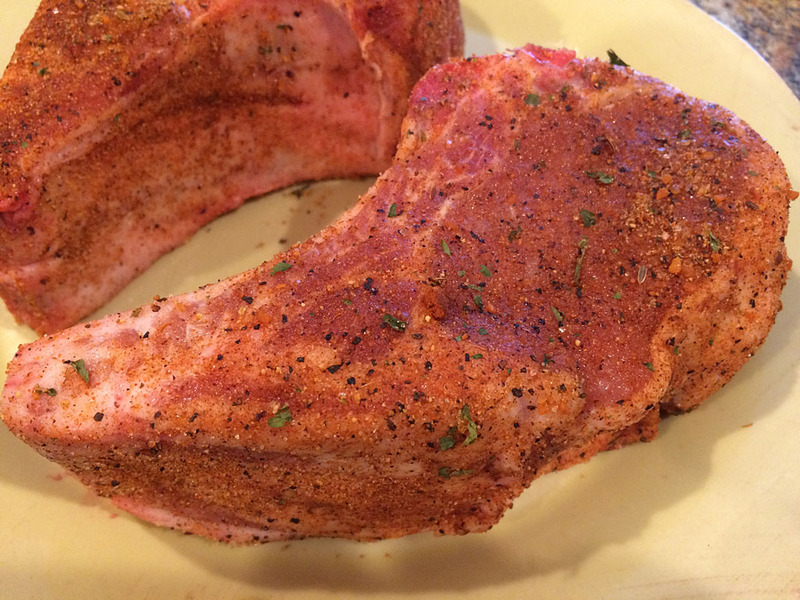 Pat the chops dry with paper towels and apply Slap Yo’ Daddy All-Purpose Rub to all sides. Cover and refrigerate for 1 hour. Preheat the grill on HIGH for 10 minutes. While the grill is heating, remove the chops from the refrigerator. Spray both sides with non-stick cooking spray. Clean the grates with a grill brush and turn the burners down to MEDIUM. Place the chops on the grate. Cook 2-3 minutes on the first side. 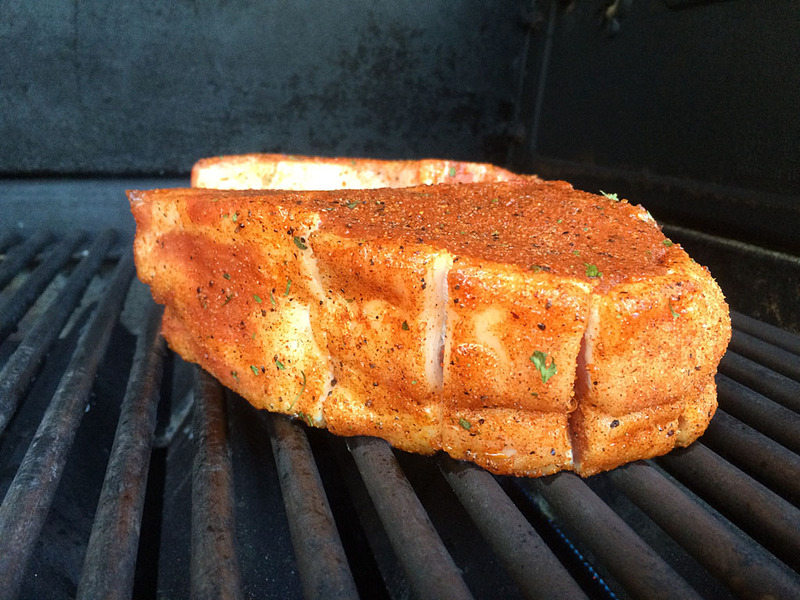 Use a spatula to help release the chops from the grate. Cook the second side for 2-3 minutes. Turn the chops back onto the first side, rotating 90 degrees to create diamond pattern grill marks. Cook 2-3 minutes, then repeat for the second side. 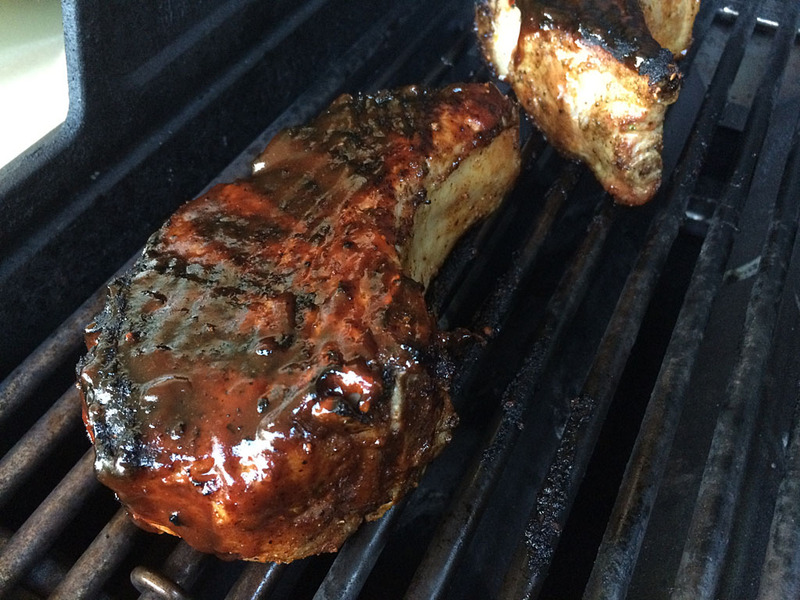 Watch the grill carefully for flare-ups during this initial searing process. The chops shown here had some nice fat around the edges that rendered and flared-up; just move the chops away from the flames if this happens. After 8-12 minutes of cooking, the double-thick chops are now nicely seared on the outside, but not even close to being done on the inside. They need to be cooked more at a lower temperature until perfectly done. Use an instant-read thermometer to check the internal temperature of the meat. Apply a thin coat of barbecue sauce to both sides of the chops and wrap them in heavy-duty aluminum foil. Setup the grill for indirect cooking at 350°F by turning some burners OFF and some burners to LOW or MEDIUM. Place the foil package over the OFF burner(s) and cook the chops until they reach an internal temperature of 140°F. 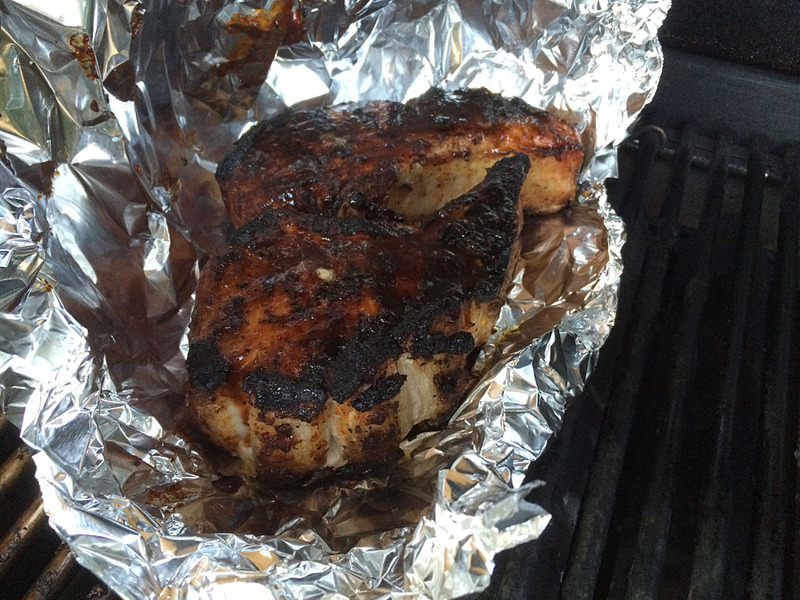 Open the foil every 5 minutes, check the meat temp quickly, then close the foil and the grill lid. While checking the temp, occasionally flip and turn the chops so they cook evenly. The chops shown here were seared for about 10 minutes then cooked in foil for an additional 30 minutes and flipped/turned twice in the foil. Your timing will vary, of course, depending on your specific grill and the thickness and starting internal temp of your chops. Once the chops reach 140°F, remove them from the foil and give them another thin coat of barbecue sauce. Remove the chops to a serving plate and let rest for 5 minutes while getting the rest of your meal to the table. 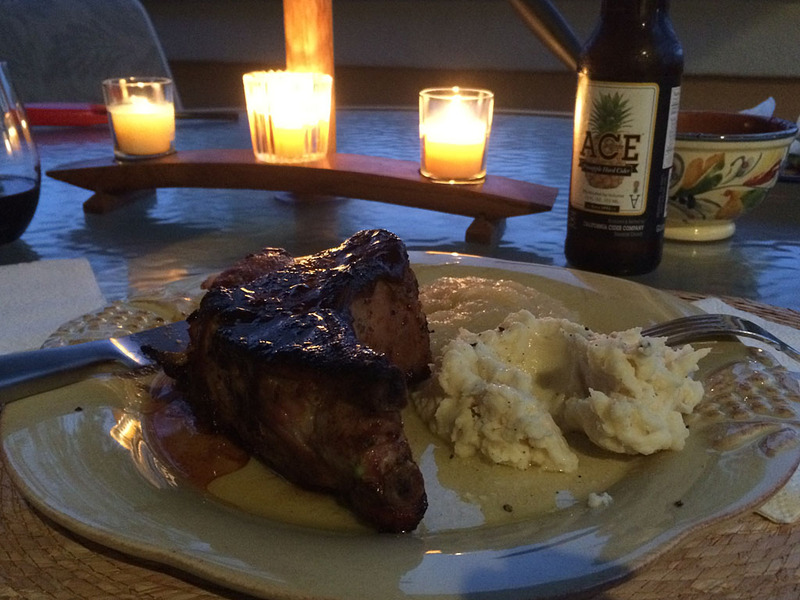 We served these pork chops with mashed potatoes, apple sauce, and a hipster pineapple cider al fresco by candlelight. 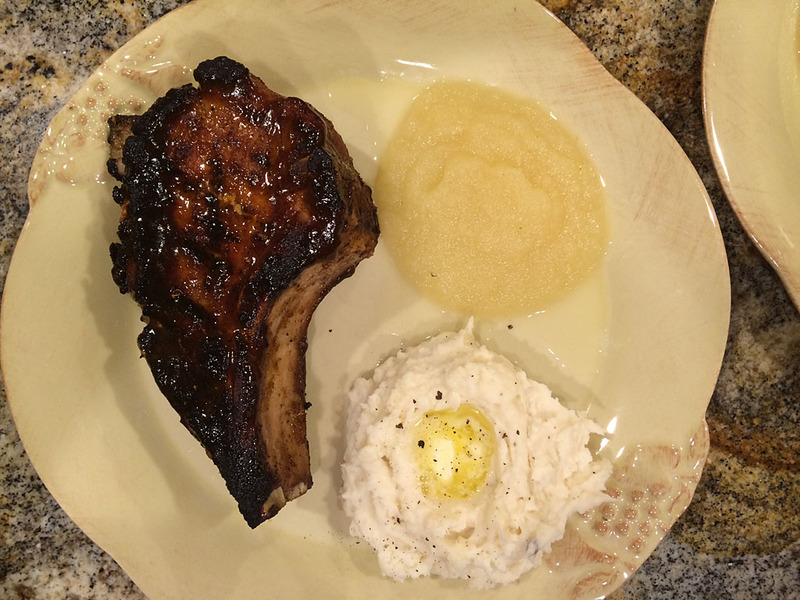 Couldn’t have asked for a nicer birthday dinner or a more succulent pork chop. I can’t wait to make these again, and I won’t be waiting for another birthday to do so! Here’s some good information from ThermoWorks, the makers of the highly accurate Thermapen instant-read thermometer, on chef-recommended meat doneness temperatures. Note that all temperatures listed are peak temperatures, meaning that meat should be removed from the grill a couple of degrees below these temps and allowed to rise during a short resting period. And in case you’re wondering, here are the food safe minimum doneness temps for meats that pose a greater health risk if not cooked thoroughly.